Earn & Save up to £17,000 With Solar PV Feed-in Tariffs.. Solar PV Feed-in Tariffs can earn and save you up to £17,000 over the next 20 years. Solar PV Panels generate electricity and you will receive payments for every unit generated plus another amount for electricity exported. You can also make substantial savings on your bills. EnergyLink's approved Installers can help with your Feed-in Tariff application to the Energy Supplier of your choice. We can arrange for you to receive three, free no-obligation surveys and quotes from local members of our network. The Feed-in Tariff is a payment from an Energy Supplier for every unit of electricity generated by Solar PV Panels. From 1st January 2015, the rate for domestic installations is 13.88p per kWh. A payment of 4.77p per kWh is also made for 50% of the electricity generated, which is the amount an Energy Supplier will assume you are exporting to the grid. Payments are made for 20 years from the date of installation and electricity bill savings continue after that. What are the earnings and savings? Domestic systems are typically between 2kWp and 4kWp in size. An example 4kW system could earn £470 from the Generation Tariff, £80 from the Export Tariff and save £250 on bills giving a total of £800 per year. A 2kW system would earn and save half this amount or £400 per year. Domestic systems typically cost between £3,000 and £7,000 to install. Feed-in Tariff payments and electricity bill savings ensure that the system cost is normally recovered within 8 to 10 years. You then continue to earn and save for a further 10 to 12 years. Feed-in Tariff payments are also index-linked so the rates increase with inflation. Read more about Solar PV. You should have between 8 and 32 square metres of un-shaded roof space available. The roof should ideally face South West, South or South East but they can be installed on East and West facing roofs. Your property will also have to achieve an EPC rating of D or above to qualify for the 13.88p per kWh payment. If not, a lower rate of 6.38p is paid. Read more about Solar PV. EnergyLink can put you in touch with three MCS and RECC approved Installers in your local area. Our Installers can carry out free surveys and provide you with written quotations. 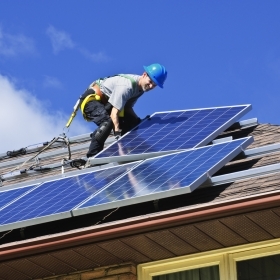 They can also undertake the EPC and help you with the Feed-in Tariff application. Simply complete our short form to start the process. An experienced Energy Advisor will telephone you to check your property, explain the costs and savings, answer any queries and then arrange your surveys and quotes.